There is a showdown brewing in the Capitol over education funding. It involves the forward funding of education that was passed last year by the Legislature. 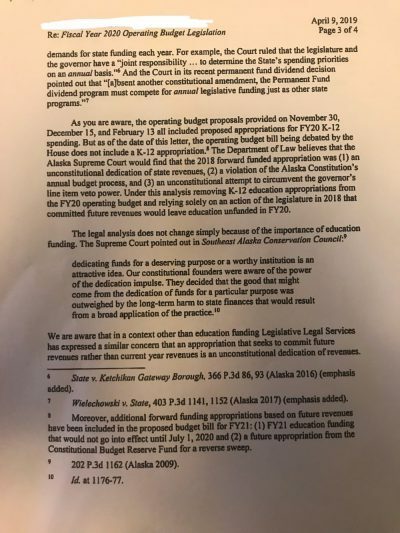 Last year, the House and Senate came to an agreement over forward funding $50 million for education for two years and passing SB 26 – the bill that allows for a draw of the permanent fund to be used for government services. This deal allowed them to pass a budget and gavel out. She is referencing the below letter, obtained by the Alaska Landmine. 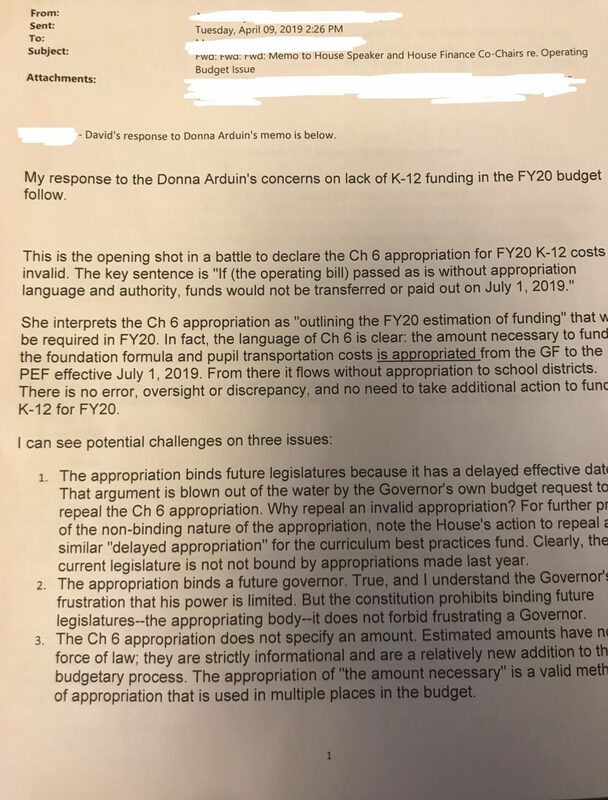 Arduin thinks the $30 million for education funding for FY 2020 should be a line item in the budget, probably because that is the only way Governor Dunleavy could veto it. By leaving that money out of the current budget, the money should be transferred based on statute. 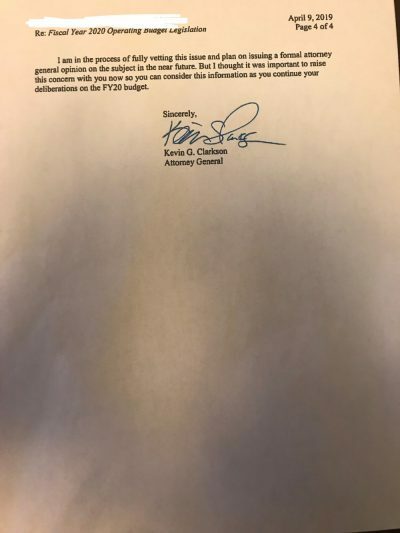 But in the letter she says if the money is not put into the budget then it will not be transferred or paid out on July 1, 2019. 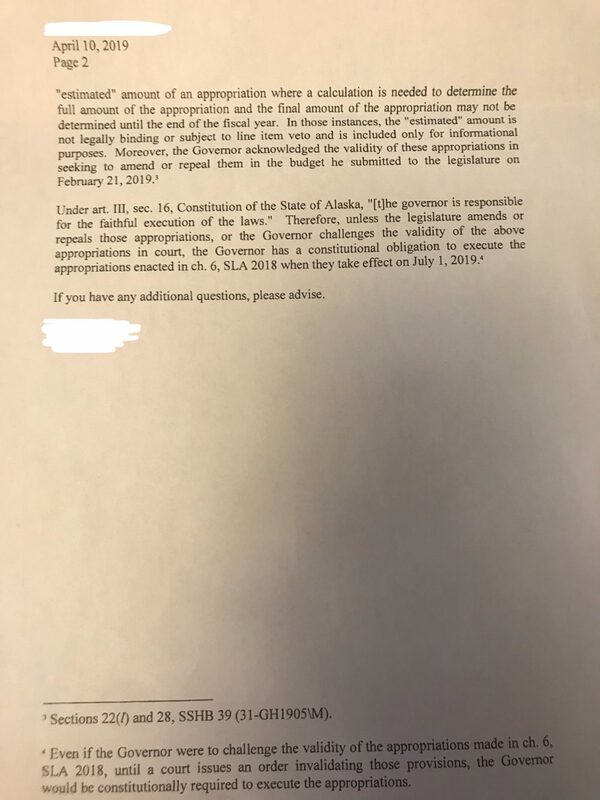 Interestingly, Dunleavy argues that the dividend, also in statute, is an automatic transfer. He seems to feel differently about this statute. The Alaska Landmine has obtained several legal memos and emails regarding this issue. To quickly summarize, Governor Dunleavy thinks the forward funded $30 million education funding for FY 2020 is subject to his veto. Legislative Legal and Legislative Finance think it is not. 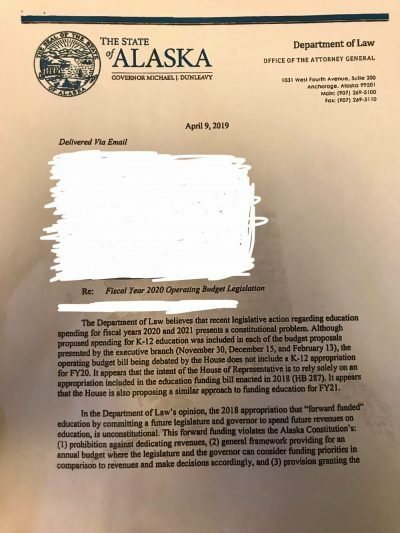 This issue will very likely be decided by the courts unless Dunleavy decides to not challenge the funding. 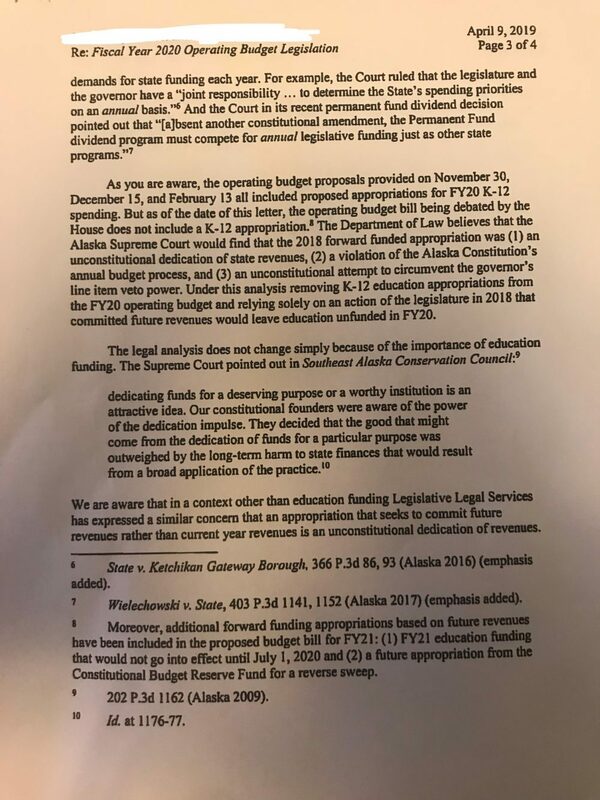 Here is a letter from Attorney General Kevin Clarkson, where he argues that the forward funding for education by the previous Legislature is unconstitutional. 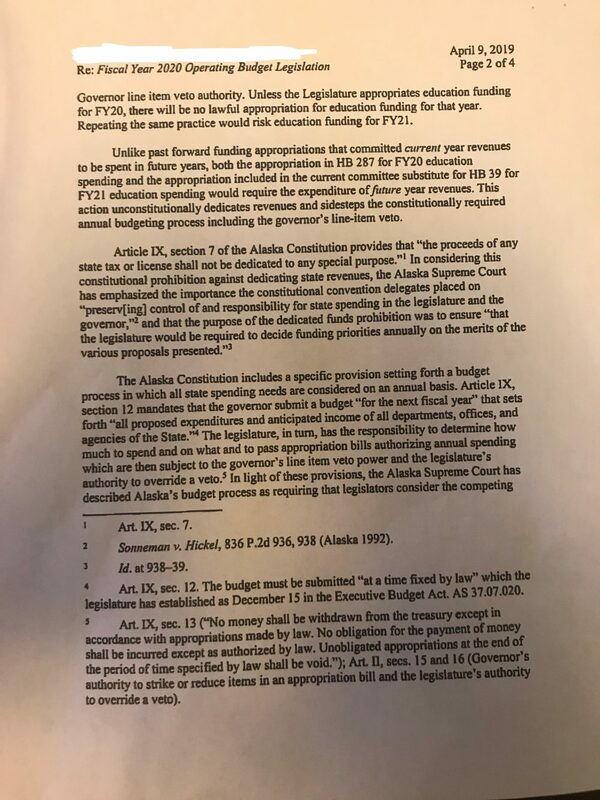 And finally, in this email from David Teal, the Director of Legislative Finance, he makes the dispute between the Legislature and Governor Dunleavy clear. 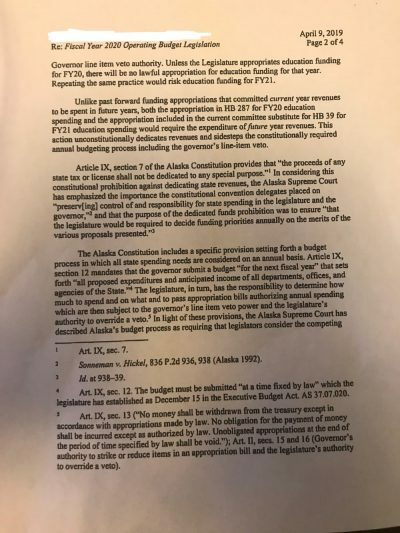 He starts by saying, “This is the opening shot to declare the Ch 6 for FY 202 K-12 costs invalid.” He also states that the Constitution prohibits binding future legislatures, not frustrating a Governor. 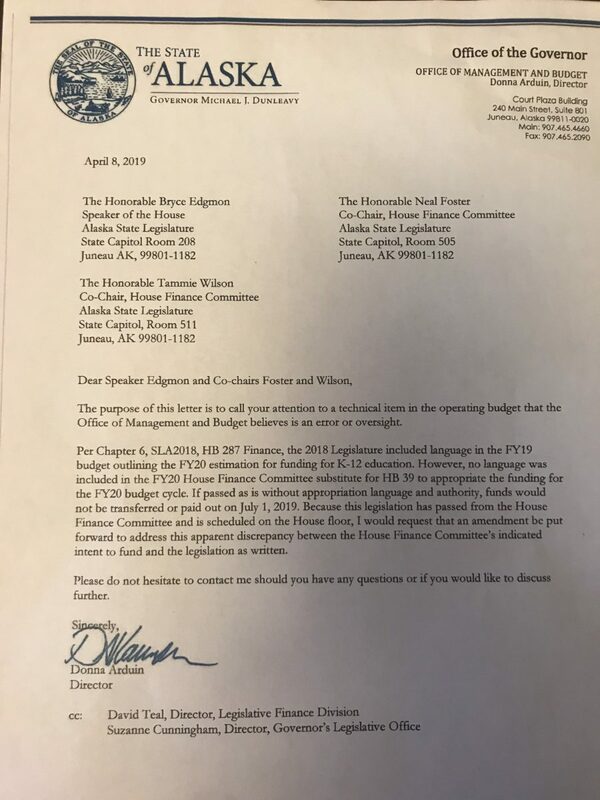 The issue also came up earlier today on the House floor during debate of the operating budget. 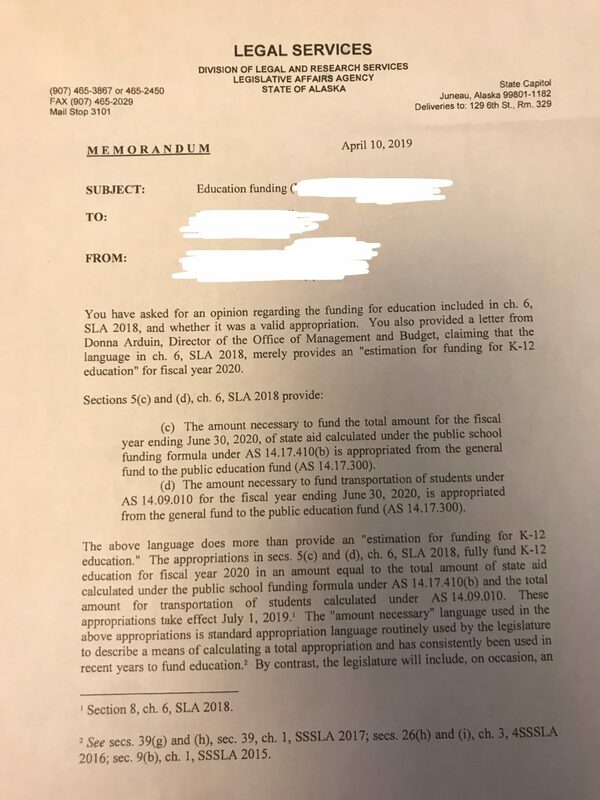 Representative Ben Carpenter (R – Nikiski) introduced an amendment with language to end the forward funding for education. Representative Pruitt (R – Anchorage) spoke to the amendment. He said he voted for the forward funding last year but is supporting the amendment because of the current fiscal situation. 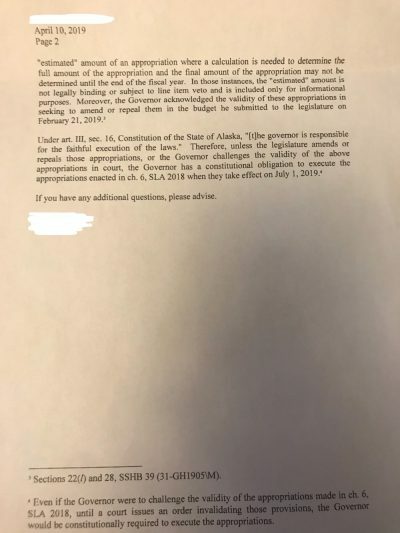 Representative Neal Foster (D – Nome) said that the Legislature has forward funded things in the past and that the forward funding for education is not unconstitutional. The amendment failed 10-27.